Accessible and practical arrangements from two popular shows, with bags of style. 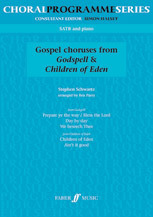 These choral arrangements provide around twenty minutes of fun and interesting repertoire for the mixed voice choir. The pieces can be used to add variety to a concert program and are sure to be a hit with both choirs and audiences alike.